Three Generations of Greek Americans: A Study in Ethnicity by Alice Scourby - International Migration Review, Vol. 14, No. 1 (Spring, 1980), pp. 43-52. 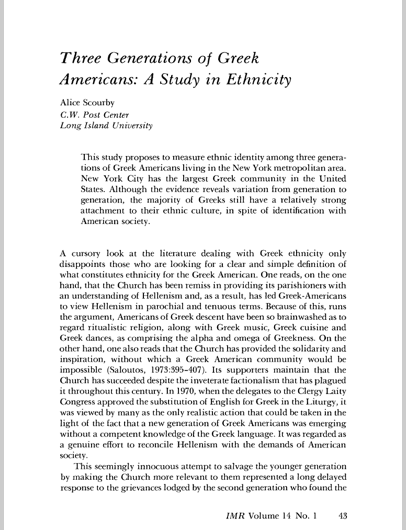 This study proposes to measure ethnic identity among three generations of Greek Americans living in the New York metropolitan area. New York City has the largest Greek community in the United States. Although the evidence reveals variation from generation to generation, the majority of Greeks still have a relatively strong attachment to their ethnic culture, in spite of identification with American society.